There’s nothing quite like a planetarium for inspiring wonder. It’s too bad you can’t experience the cosmos like this at home…except you can! That is, you can somewhat recreate the experience of a planetarium with a home planetarium projector. Unfortunately, a lot of the night sky projectors on the market are junk! I’ve done the research to find the ones worth considering. Check out this list so you don’t waste your money. These are my top picks for home planetariums. There is a good choice for everyone on this list, depending on your budget and the kinds of features you are looking for. 11.1 Which ones project moving stars and galaxies? 11.2 Are these laser projectors? 11.3 Which one will give me the most accurate representation of the stars and solar system? 11.4 Can I DIY a bedroom planetarium? 11.5 Is there one with an audio guide? 11.6 I want a home planetarium for adults, what is your top pick? You might think of Sega only in the context of video games but this is another Japanese company: Sega Toys. This nice home planetarium uses a disc-based system, with different sky maps available. It comes with discs for the northern and southern hemispheres. You also get a large double-sided poster that shows you the skymap so you can see a detailed look at what is projected on your ceiling. Additional discs are available for purchase separately, including Warped Andromeda, Day Earth and Moon, and Night Earth and Moon. Using Ultra-bright 3-watt white LED technology, this system projects the sky onto a ceiling, wall, or another plain white surface. The ideal projection area should be able to fit a circle with 106″ in diameter. It has 60,000 stars and it looks quite realistic for a home system. It was designed by Japanese inventor Takayuki Ohira who has worked with some of the world’s most famous planetariums, so it’s not surprising that the quality is so high. There is even a shooting star function that you can choose to add to the experience. It’s easy to use this planetarium, really as simple as just pushing a button. You can also set a timer if desired, with options for 15, 30, and 60 minutes. You can also adjust the angle and focus which is nice when your projection space is limited or for when you want more detail. This unit is pretty compact at 6.5″x6.3″x5.9″ and it weighs less than 2 pounds making it easy to put away when you’re not using it. The Sega Homestar Original is a bit pricey for a home planetarium but it offers a lot of value with the realistic skymap discs. This is our top choice for best home planetarium this year. The Smithsonian Air and Space Museum is home to one of the best star projectors out there. While a home planetarium could never truly replicate the scope of what you’d get there, Smithsonian has made a home projector that tries to come as close as possible. Many reviewers think they failed at this but others disagree. The projector features a rotating pattern of the northern hemisphere sky. It also shows detailed looks at planets, nebulae, moons, asteroids, and other celestial bodies. You can choose what you want to see, with over 50 different image combinations available. This projector works best on a flat and plain white surface. You are able to adjust the projection angle. A timer function is available with automatic shut-off, making it a good option for those who want to fall asleep under the stars. 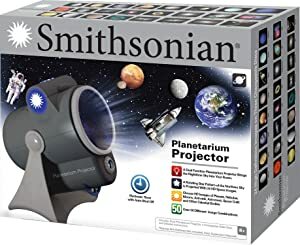 The Smithsonian Optics Room Planetarium might fall short of being a good replica of the Smithsonian Planetarium but it is reasonably priced and offers the ability to choose what you see. The design of this home planetarium is fitting as it almost looks like a spaceship. When not in use, this attractive device will look nice on a bookshelf. It projects more than 60,000 stars and you can adjust both the focus and the projection angle. The peripheral motor function makes the stars move, making the night sky come alive on your wall or ceiling. You can also turn this off so the sky is still. Noted Japanese engineer and designer Takayuki Ohira was involved in the development of this device, adding realism and authenticity. A timer function is available with options for 15/30/60 minutes. This projector uses discs for displaying the stars and it comes with two discs, one showing the northern hemisphere sky and another showing constellations. Additional discs are also available for this star projector. You can adjust the focus to make sure the display is crisp and clear. A shooting star function is also available. The Homestar Classic is essentially a more affordable version of the Sega Homestar Original. It offers an attractive design and a number of projection options. This home planetarium stands out for the stunning clarity it offers. Unfortunately, this next-level display also means a higher price tag. If you want bright and beautiful stars, though, the price may well be worth it. It displays 10,000 stars. It comes with two discs, one displaying stars and another displaying the Earth/Moon/Sun. Motorized image rotation makes the display of the night sky come alive with realistic movement. Turning the rotation off is also an option. This is another home planetarium with a sharp, thematically appropriate design. 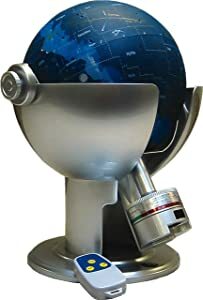 The futuristic sphere will look nice on display even when you’re not using it. You can adjust the focus angle which you’ll want to do to make sure you’re getting that vivid clarity this device offers. You can also adjust the projection angle. A timer function with automatic shutoff is available, with options for 30 or 60 minutes. The InMyrRoom Star Theatre Pro offers stunning clarity and several nice features but it is overpriced, especially because some of the parts feel cheap and lack durability. This planetarium works differently. To display the night sky, it uses green lasers and holographic technology. It has two precision glass lenses that create thousands of laser pinpricks, mimicking the night sky. This projector is also unique for being able to display blue nebula cloud formations. Switching between the star view and the nebula view is as easy as turning a knob. Although both views are great independently, you can also see them both at once. The nebula cloud formations on top of the stars make for a stunning and captivating display. A really nice feature with this projector is that you can adjust the display area to the size of your projection surface without losing any clarity or quality. There is no timer function with this projector but it will automatically shut off after four hours. Something else that makes this projector unique is that it has keyhole slots in the base for wall mounting. This star projector has a unique design, with a black base and a silver star. It is an eye-catching piece that would look nice on a bookshelf. Although the design is nice and unique and appropriate, it does look a bit cheap. The construction itself also feels a bit on the cheap side. The Parrot Uncle Laser Stars & Nebula Projector is a good laser project that stands out for being able to mount it to a wall and the ability to adjust the display to the size of your projection surface. The night sky is always changing. This projector lets you see what the sky looked like on specific dates and at specific times. This unique feature offers a lot of value, making it the best star projector out there if you are into astronomy. You could show a child what the night sky looked like on the day or even the moment they were born. You could level-up your date night by showing your spouse or lover what the sky looked like on the day you met or the day you got married. This projector is also a good option for budding astronomers who want to learn more about the night sky. Realistic star maps and constellations of the Northern Hemisphere come alive through the display. Over 8,000 stars are shown and 35 constellations can be displayed. There is also a shooting star function. Precise data from real astronomers make this device a source of endless fascination and learning. Rotation and movement are available, with five different speed settings. This projector even lets you learn about horoscopes. A timer lets you choose between 30, 60, and 120-minutes. This unit is battery-powered, using 3 AA batteries with no other power options. 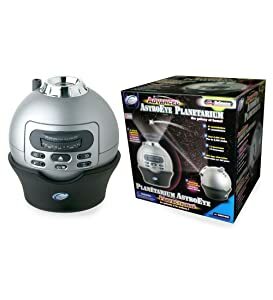 The Motorized AstroEye Planetarium requires batteries and only displays the Northern Hemisphere but it is well made and it really stands out for its ability to display the night sky on a particular date and time. Japan is often a leader in all things technology and home planetarium projectors are definitely among the products that Japanese makers have mastered. The quality of this projector is very high. Unfortunately, all of the instructions are in Japanese. While the operation is pretty easy to figure out, the language barrier is still frustrating. This is especially true with the constellation display, which shows the constellations along with their names in Japanese. There is also an educational DVD included but that, too, is in Japanese. If you can get over the language factor or if you speak Japanese, this is one of the best projectors on the market. It does allow you to display the night sky based on time and date. You are able to adjust the angle and focus. There is also a timer function with options for 30 and 60 minutes. Rotation is available to make the sky come alive with realistic movement. The Nashika Real AstroTheatre offers excellent clarity and good display options but it is pricey and everything is in Japanese. 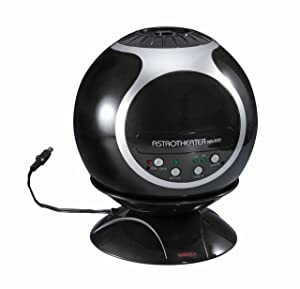 This inexpensive option from Uncle Milton isn't going to be a good option for an adult looking to replicate the wonder of a planetarium at home. It is, however, a good device for kids, especially those interested in space. This planetarium stands out for being 3D. The necessary 3D glasses are included. The display plus the 3D glasses make the night sky really pop in an engaging way. You can still enjoy the projection display without the 3D glasses if preferred. It projects stars, planets, and constellations. This makes it a good tool for kids who want to learn about astronomy. Information about various constellations is displayed along with the image, providing helpful context. A science poster is included as well, to add to the learning value. This projector is extremely compact, fitting in a typical adult hand. You need 4 AA batteries to power this projector. 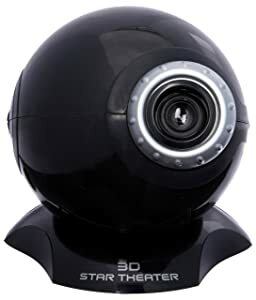 The super affordable Uncle Milton 3d Star Theatre is a good option for kids, with its engaging and educational 3D display but it’s not a very realistic home planetarium overall. This home planetarium strives to add to the overall experience of in-home stargazing by included speakers. 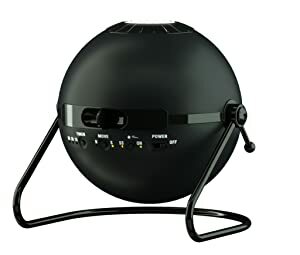 It has a built-in Bluetooth speaker that connects to a paired iPhone or Android device. You can then listen to your favorite music while gazing at the stars. You could also listen to a space-themed science podcast or audiobook as well so that you're learning about space while feeling like you are "in" space. This is another home planetarium that lets you customize the display so that you can see the sky on a particular date and time. Imagine using this to surprise your spouse - the night sky on your wedding date with the speakers playing your song! That would definitely be a romantic gesture with a wow factor. Rotation and movement of the display is available, for a realistic look at the sky. You can customize the speed of this movement by selecting one of five available speeds. The motor during the rotation is whisper-quiet so it won't interrupt your mood or disrupt your zen state. This device projects 8,000 stars and gives an accurate view of 61 constellations as seen from the Northern Hemisphere. The design of this desktop unit is attractive, with a geometrically patterned base and an orb that you can adjust for your preferred display angle. Three AA batteries are required for operation. The attractive 8,000 Stars Home Planetarium By EastCoLight stands out for having a built-in Bluetooth speaker to help you create the perfect stargazing ambiance. 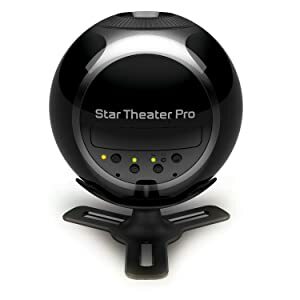 The affordable Ioptron Mini Livestar Planetarium gives you a number of options. You can set the latitude, date, and time to see the night sky anywhere in the world on any night. It uses computer control technology that lets you access a 4,000+ object database with 256 user-definable objects. This lets you customize the display in a number of ways. Gentle rotation is available, creating a realistic look at the sky in motion. The unique design is attractive and serves as a learning tool even when not on. It looks like a globe and shows details about the galaxy with labels. This helps you understand what you're looking at. This home planetarium really has the potential to be great but the execution is a bit iffy. The construction quality is not great and the materials aren't very durable. There also seem to be some quality control issues. 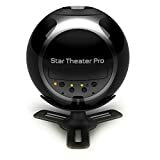 The Ioptron Mini Livestar Planetarium has the potential to be a great device and when it works, it works quite well. Unfortunately, it tends to not live up to that potential due to poor craftsmanship and quality control issues. Which ones project moving stars and galaxies? The majority of the planetariums on this list have a movement or rotation option. There are only a few exceptions like the Uncle Milton 3D Star Theatre. On some of these home planetariums, you even have the option to adjust the speed of the motion or rotation. 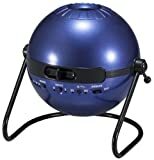 These include the 8,000 Stars Home Planetarium By EastCoLight and the Motorized AstroEye Planetarium. The only home planetarium on this list that uses lasers is the Parrot Uncle 270 Degrees Rotating Laser Stars & Nebula Projector. The other projectors rely on bright LED lights to create the projection. Which one will give me the most accurate representation of the stars and solar system? The Sega Homestar Original and the Homestar Classic offer very realistic representations of the night sky. The projectors that let you see the night sky by specific dates, times, and locations, offer a different level of accuracy. These include the 8,000 Stars Home Planetarium By EastCoLight and the Nashika Real AstroTheatre. Can I DIY a bedroom planetarium? Absolutely! You won't be able to achieve the same level of clarity and accurate representation, though. You can create something fairly easily that will give you something of the pleasure of a home planetarium. Here is a good guide for making a DIY planetarium with a metal bowl. Or you can check out this video where a NASA flight director shows how to make a DIY planetarium with an oatmeal container. If you're really looking for galactic accuracy in your DIY home planetarium, you can make a smartphone projector like this and then display HD videos of space from your phone. Building a DIY bedroom planetarium can be a fun project, for sure, but you'll never be able to get the level of clarity and accuracy you can by purchasing a ready-made unit. Is there one with an audio guide? Unfortunately, none of the home planetariums on this list include an audio guide. However, Uncle Milton products do let you download an audio tour that goes with the planetarium. You just go the Uncle Milton website and enter a special access code that comes with the product. I want a home planetarium for adults, what is your top pick? The Sega Homestar Original is my top pick with the InMyrRoom Star Theatre Pro, the Motorized AstroEye Planetarium, and the Nashika Real AstroTheatre close behind. All of these offer good accuracy, a nice set of features, and good build quality. Are you ready to do some stargazing from the comfort of your own home? Which one of these home planetariums do you have your eye on? Do you know of a great night sky projector that I should have included? Let me know in the comments! Do you have any questions? Ask away. Now, if you'll excuse, I'm off to fall asleep under the stars. Thanks for your reviews they are very helpful. I was leaning towards the Sega and now I’m convinced. I want a constellation or star projector that can fill my living room of approx. 20ft by 20 ft which one can handle this room size? I’m looking for a projector that also projects nebulae. Which one has the best nebulae images?